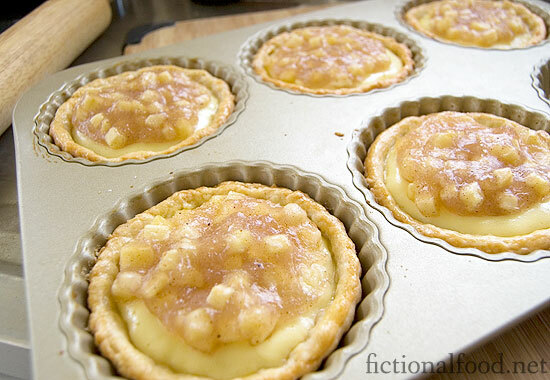 Back in October, I tried doing Goat Cheese and Apple Tarts from The Hunger Games that I really didn’t like all that much. They were “edible”, but they certainly weren’t something that I would think tasted good enough to sell, so I went back to the drawing board and did a ton more research. 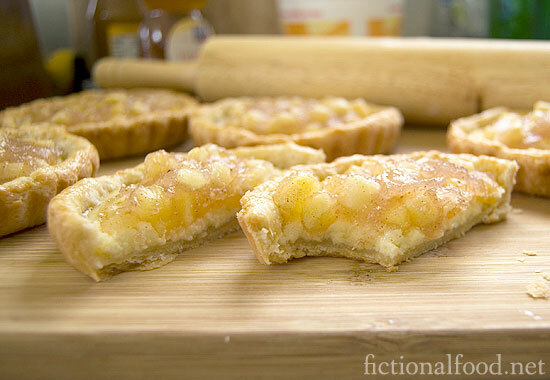 I trolled recipes online for different parts of a tart that I thought would taste good and eventually, after drawing from three separate recipes, I was able to come up with something that tastes way better than my last attempt. It tastes so awesome that I am finally confident enough to give a recipe for it. The instructions for making this are all at the bottom of this post and I recommend making the pie crust first, then while that chills in the fridge, make the two fillings. Make sure you have a pastry blender to do the crust. I had to experiment four separate times until I got the baking down right, which is a whole lot of time and work! Anyway, first, you roll out a small ball of dough (I ended up making 9 tartlets, but if you roll thinner, you should be able to squeeze in 10) and then put it into your pan. I got mine at Williams-Sonoma. Pinch off any excess and then fold the outsides over into the pan, pressing the sides so that they take the groove shape of the pan. Next, brush the crusts with an egg wash made from 1 beaten egg and 1 tsp of heavy cream. This will help give the crust a nice golden brown color. My first three baking attempts kept giving me pale crusts, even with more baking time and a higher temp, so I finally went with the wash and that did the trick. Fill the bottoms with the goat cheese filling, about two spoonfuls. Enough to fill it up about 1/3 way. Bake at 350 degrees for 15 minutes. After the tarts come out after the first bake, scoop some apple pie filling into the middle, making sure to leave some of the goat cheese visible. It should be firm enough where it doesn’t sink in. Return to the oven and bake for another 20 minutes. Here’s what they look like when they first come out of the oven. 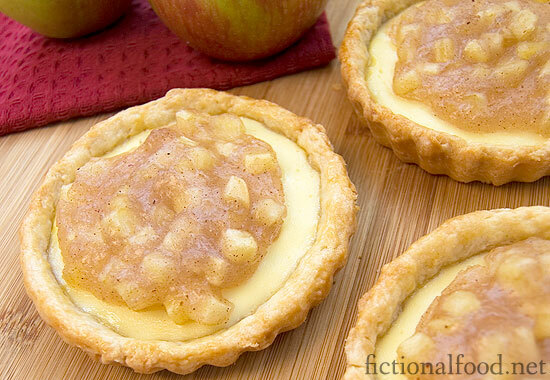 The goat cheese custard on the bottom should be slightly puffy, with the apple pie filling have a nice gloss to it. The crust should be a nice golden brown. Let it cool in the pan for a bit before gently removing to cool on a rack. The shortening in the crust shouldn’t give you any sticking problems. Mine slid right out with no problems and I didn’t grease the pan. After they’ve cooled for a bit, give it a try. They taste heavenly when they’re still warm! Sadly, if you want to know what it tasted like for Peeta, you’d need to leave yours out for a day or two and then eat it when it’s gone stale. Huh. I always assumed the shopkeepers live a soft life. And it’s true, Peeta has always had enough to eat. But there’s something kind of depressing about living your life on stale bread, the hard, dry loaves that no one else wanted. 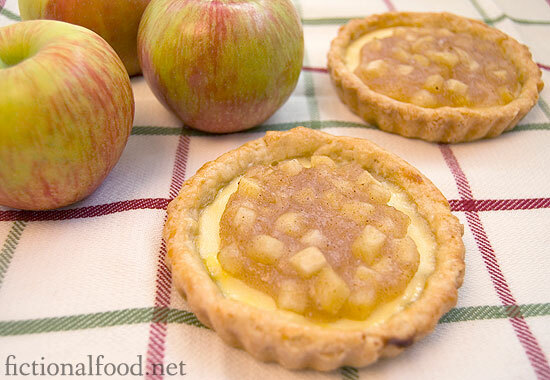 I’m no pastry chef, but these really do taste amazing, and I usually can’t stand apple pie. My daughter totally loved it too, though she said it tasted awful when it was cold. I went with diced apples because figuring out how to arrange them when they’re sliced is just a nightmare when you’re making tartlets. 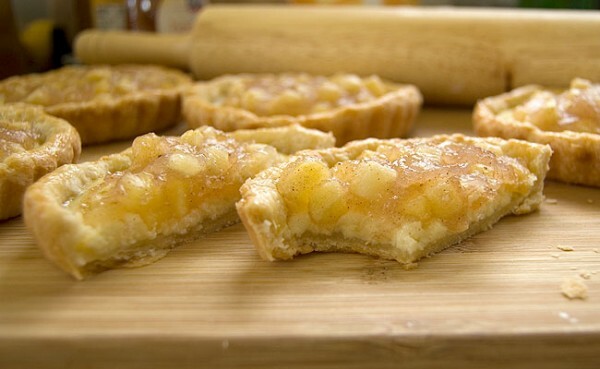 After my experiments last night, I was lying down in bed and started panicking, thinking that maybe tarts were only supposed to have fruit without any kind of sauce, but a quick look at Wikipedia says that all it means is that it’s a pie without a roof. Whew! One more picture to show you the importance of not going overboard with egg washing. I left a little bit in the shell and you can see the yellow in this one. You definitely need to be careful when brushing it on! This recipe is a bit of work, but the effort is definitely worth it in the end. 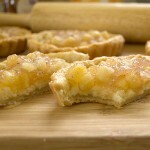 The Mellarks make a goat cheese and apple tart in their bakery. First, work on the pie crust. Combine the flour, sugar, and 1/2 tsp salt in a bowl. Using a pastry blender, cut the shortening in until it’s nice and crumbly. Mix together one beaten egg, vinegar, and 4 tbsp water. Whisk together in a large bowl and gradually add the flour mixture. Mix with a fork, adding the last tbsp water. Do not knead the dough as you want the little pieces of shortening to be in the dough, which helps the flakiness. Form the dough into a ball and wrap tight in plastic wrap. Chill in the fridge. Next, do the apple filling. Combine 1/2 cup sugar, cornstarch, cinnamon, nutmeg, and pinch salt. Put 1 1/2 cups water in a pot and add the dry ingredients, using your (very clean) hand to break up the cornstarch in the water. Add the apples and heat on high and boil for two minutes, stirring constantly. Mixture will thicken. Lower heat and simmer covered for 8-10 minutes. If it’s too thick, add more water. Next, make the goat cheese filling. Using a whisk, combine the goat cheese, sour cream, 3 tbsp sugar, and honey until smooth. Add one egg and stir until the filling is a nice golden yellow. It should be smooth and creamy. Separate your dough into 10 equal sized balls. 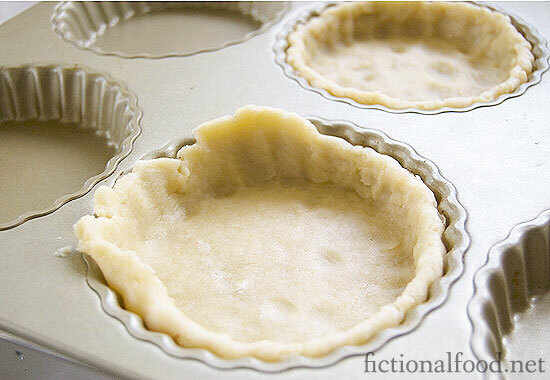 On a floured surface, roll out the dough, wide enough to fit your tartlet pan (or muffin pan). Press dough into side and fold over into the middle to form a nice crust. Make an egg wash by beating 1 egg with 1 tsp heavy cream. Lightly brush onto the crusts, taking care not to leave any excess on the bottom. Fill about 1/3 to 1/2 with goat cheese filling. Bake for 15 minutes. 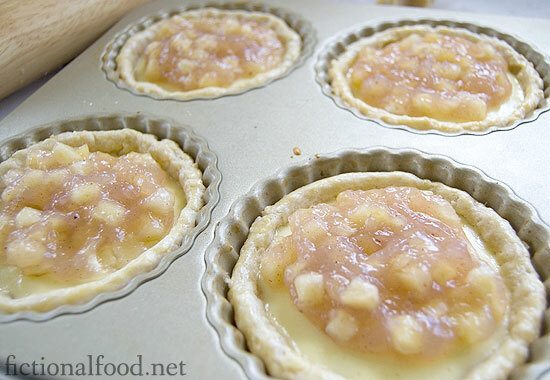 Fill the center of the tarts with the apple filling, leaving some of the goat cheese visible on the sides. It should be firm enough to support the filling. Bake for 20 minutes. Eat while still warm. If you use a muffin pan, baking time may change and you’ll be able to make more with the amount of dough. 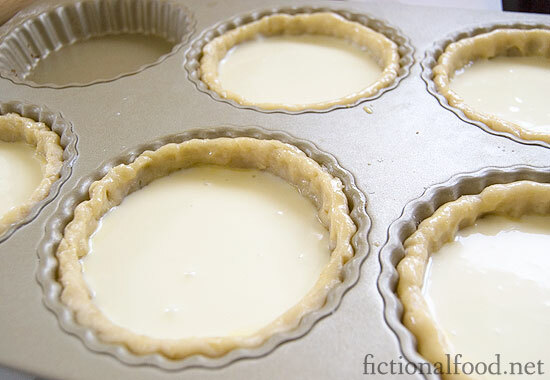 Start with 10 minutes and check the goat cheese filling’s firmness, adding 5 minutes at a time until done. For the second bake, check your crust color at 10 minutes, adding 5 or 10 minutes as needed.